If you’ve read any of my MLB articles, you know that I’m a big advocate of looking at Vegas lines to be the baseline for your DFS picks. Out of all the major Daily Fantasy Sports, I find this to be the most true with DFS NFL. We just don’t have many statistics to go off of when we make our picks, especially early in the season, and after speaking with sports bettors around Las Vegas, it seems that most are in agreement that NFL sports betting lines are actually the most accurate lines out of any sport. What this means is, when the line says Patriots -7 over the Steelers and the over/under is 47, you can make plays assuming the Pats will score 27, the Steelers will score 20, and the Pats will likely lead most of the game. And I’ve found that the lineups we make using this strategy (with incorporating injury information) will be very profitable. The tough part about reading sportsbook lines, however, is figuring out who will benefit. Does the Patriots line mean Tom Brady is in for a big game? Does it mean whoever starts at RB for the Pats is a lock for a TD? These questions are not answered by just looking at the line at face value, but this is why I love our free tool NFL Sportsbook Projections. This tool is the starting point for me every week of the NFL season, and I’ve found it to be unbelievably accurate when analyzing what aspect of a teams game (Running or Passing) will get the biggest share of a teams expected points. Keep in mind though, some of these calculations are based on last season’s stats. Since there are several coaching and player changes this year, we need to make sure our stats aren’t skewed because of something that’s just not relevant anymore. You can read more about how we calculate run point share and pass point share in an article find here: https://dailyfantasywinners.com/fantasy-categories/featured/introducing-runpass-share-nfl-point-projections/. 1) Find the teams with the highest run point share and pass point share. This will be very clear on the table and I’ll list the top 6 for run share below. 2) Look at how many players will likely contribute to that aspect of the game. For example, the Eagles are expected to score a lot of points in the pass game, but they are a creative offense and will likely spread it around. 3) Look at some hidden ways a player may contribute to either side. For example, if a team with a high pass point share may get some contribution from a pass catching RB. Or a QB may get yards in the run game. With week 1, it’s a little harder to determine how a teams offense will run, but we can infer a lot from how they played last season and make some educated guesses about how things may change this season. The Dallas Cowboys (14.46 Run Points) – The loss of Demarco Murray obviously will hurt Dallas’ run game here, but Dallas’ O-line is ridiculously talented and anyone who’s inserted as the Cowboys RB will likely have success here. I don’t think Jason Garrett is going to change his offensive gameplan that worked so well last season just because Murray is gone. The issue here is there isn’t a clear starter. While the Dallas media seems to believe Joseph Randle is the starter until he proves otherwise, I’m concerned because of his lack of ability in the receiving game. The fact that he doesn’t catch passes actually hurts in a couple of ways, not only is he not going to get points via receptions, but he also likely won’t be in the game if Dallas trails or when they need to run a 2 minute offense. That being said, it’s not exactly a show of faith in Randle or McFadden the Dallas went out and acquired Christine Michael from the Seahawks. I doubt Michael gets much play week 1, which helps straighten things out a bit, but it’s just really hard to say who we should use. I don’t think I’ll be using Randle or McFadden in cash, but I do think given that one of these guys could be in for a huge game if Dallas gets up in this game (which Sports Bettors seem to expect), I think both are certainly GPP plays. I think the upside one of these two could have will be underrated by DFSers. I especially like Darren Mcfadden’s price on DraftKings, he’s only $4,400. But Randle seems like the higher upside play, even without any receptions. The Philadelphia Eagles (12.22 Run Points) – I just want to point out before I get into the Eagles that Dallas is expected to score over 2 more points in the run game here. It just goes to show how good the Cowboys are expected to be in week 1 on the ground. The Eagles have a tough situation here for fantasy purposes as Demarco Murray, Ryan Matthews, and even Kenjon Barner will share time at RB. Don’t get me wrong, Murray should get his share of touches, but I just don’t expect him to get the same amount of touches as he got in Dallas. That being said, the Falcons D is awful and Murray is a fantastic player. But we want our high priced RBs to be more of a slam dunk than Murray is week 1. 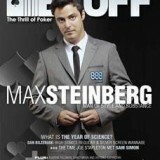 He’s in play in GPPs, but I likely won’t use him for cash. His $6,700 price-tag on DraftKings is solid. The Green Bay Packers (11.60 Run Points) – Finally we get to a situation where things are more clear. 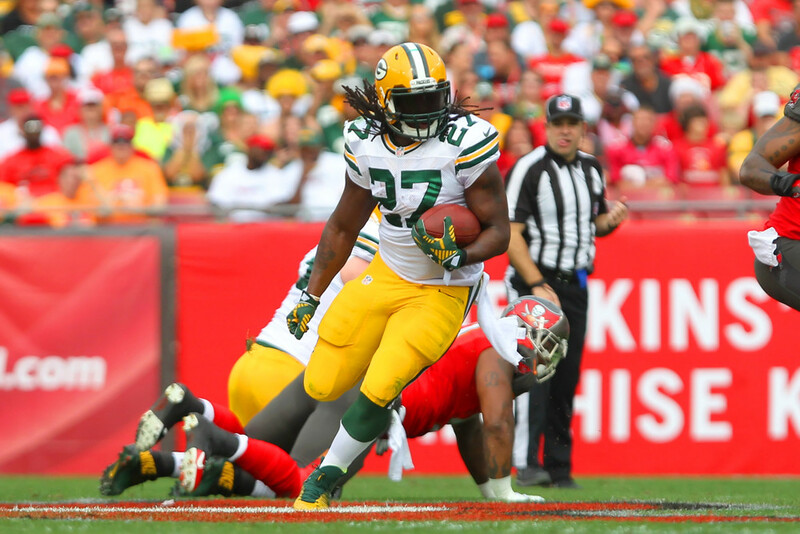 Eddie Lacy is the clear #1 back on this team and is also a pass-catching and goal-line back. When I see such a high run share in a situation like this, it’s incredibly exciting. And with the absence of Jordy Nelson, the Packers will likely be even more inclined to lean on the run game and use Lacy more in the pass game. This pick could not be more clear, Lacy is the top RB option week 1 and it’s not even close. His price is pretty fair on both sites as well, he’s $8,500 on FanDuel and $7,500 on DraftKings. The NY Jets (11.51 Run Points) – Someone of the forums was talking up Chris Ivory as an under the radar RB pick, and I could not agree more. The Jets have a completely new coaching staff, so we could see a slightly different approach this season, but I have my doubts given their QB is Ryan Fitzpatrick. I think they will rely on their defense as usual, especially against the Browns, and it’s same to assume the Jets will run a lot. Without Chris Johnson, Ivory is now the #1 back, and like Lacy completes the RB trifecta as a goal-line back and a pass-catcher (don’t underrated the importance of this, it not only is a fantasy point boost it also makes his usage more predictable). His price on DraftKings is absurd at $4,100. The Cincinnati Bengals (11.44 Run Points) – This may seem a little unclear with two talented RBs on this team in Gio Bernard and Jeremy Hill, but I think Bernard is used mostly in the pass game and probably only gets a few rushes. Hill should get the majority of these run points. The Raiders D was just horrible against the run last year and it should be more of the same this year. That being said, I don’t love Hill’s price on either site, but he’s certainly a GPP play with some big game potential in his second year. The Houston Texans (11.06 Run Points) – This is probably the most shocking team on this list but it makes sense if you know the Texans offense. Bill O’Brien likes to run the ball, a lot, and that’s not going to change with Brian Hoyer at QB or even with Arian Foster out. With Foster out, it really does seem like Alfred Blue will be the #1 back, unless you believe Jonathon Grimes will take significant time away from him, which I don’t. And, no, I don’t believe in Chris Polk, at least not for now. If he was more in Bill O’Briens plans, he wouldn’t have had 10 carries in the last game of the preseason. I don’t believe we’ll see Blue with high ownership here, he’s not a name young talent and he’s on what will likely be an anemic offense, daily fantasy players simply won’t be excited to use this guy. But even if you think Blue is a mediocre player and are worried about his playing time, he’s still very much in play. This is because his price, it’s just too good (especially at $3,600 on DraftKings) to be passed up because of a few flaws. And he does have some positives, he’s bigger than Grimes and should be their goal-line back, and he’ll get some work in the pass game. I think he’s one of the best dollar-for-dollar plays week 1. Justin Forsett – His new offensive coordinator is Mark Trestman, who was dead set on using Matt Forte on every down last year and a ridiculous amount in the passing game. Forsett is not as talented as Forte, but if the Ravens are trailing the Broncos in this game like we expect, Forsett should catch a lot of passes. Lamar Miller – Washington has improved their D, but they still aren’t going to be good. The Dolphins improved D should provide good field position and opportunities for Miller to score a TD.